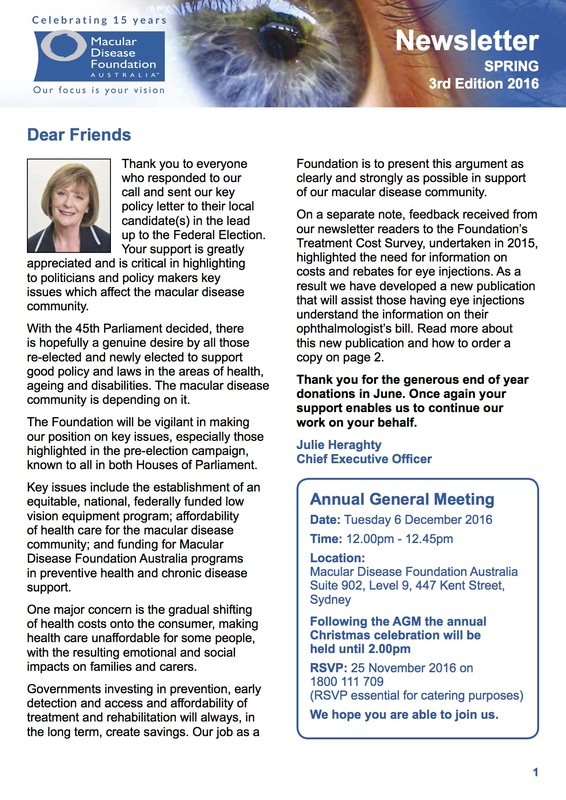 The Spring 2016 newsletter includes an update on the Foundation’s 2016 Federal Election campaign and it announces the release of a new fact sheet, “Eye injection treatment costs and rebates” which can be ordered from the Foundation. The newsletter features Shirley’s story of embracing low vision aids and announces the part-funding of a new research project, plus much more. To find out more: Macular Degeneration Spring Newsletter. Subscribe to this free quarterly Macular Degeneration Newsletter. The newsletter is available in audio and can be listened to below. Alternatively, an audio cd can be ordered free of charge by subscribing to the newsletter or calling 1800 111 709.